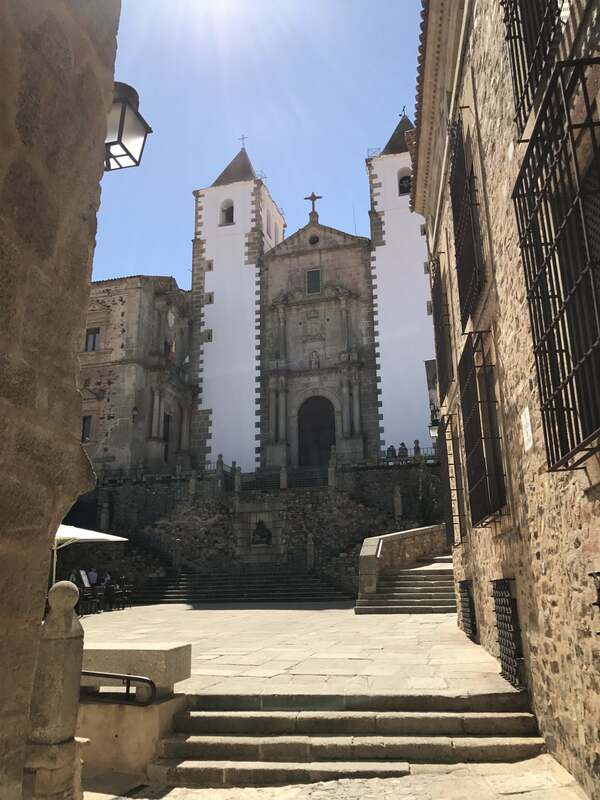 As we headed north out of Merida toward Salamanca, we passed Cáceres and decided to pull over, explore the old town and have lunch. 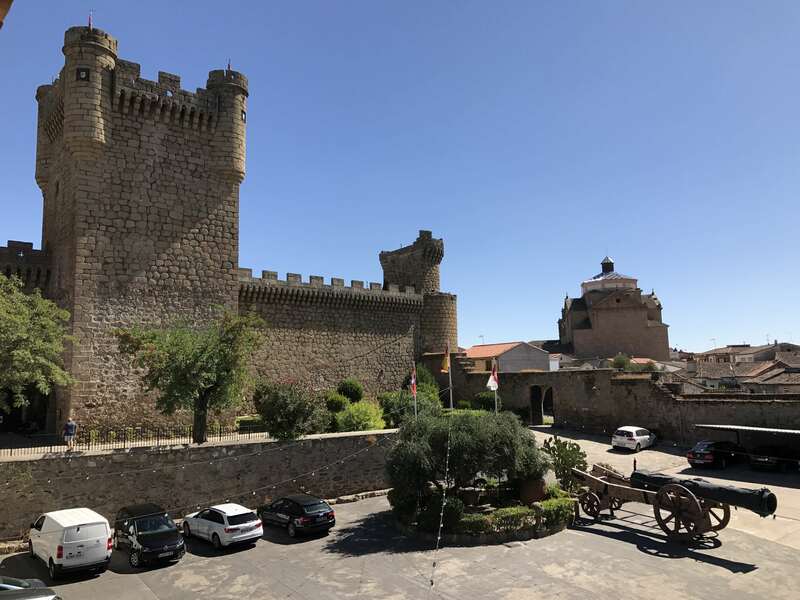 Cáceres was also founded by the Romans, and has a cool old town called Ciudad Monumental with a mix of Gothic and Renaissance architecture. Like many of these old towns, it’s a wonderful experience walking the old cobbled streets between the fortified houses, palaces, and churches. After driving 250 miles southwest from Madrid, we finally arrived in Mérida, home to many Roman ruins. When we first met and got married, Cris worked for Continental Airlines, and I traveled for free on her “buddy passes.” However, with a buddy pass you travel on space available. One time we were trying to get from Denver to Cancun, but as you can imagine, all seats were filled. We looked on the Continental route map, and saw that they flew to Merida on the Yucatan peninsula, and there was space available. It looked like a few hour drive at most to Cancun, and we figured we’d take a cab. We were young, adventurous, and threw caution to the wind as we got onto the plane. Ha! When we got to Mérida, which we really liked, and looked into a cab, people there told us it’d be several hundred $. We were young, adventurous, and poor, so we figured we had to find another way. We walked to the bus station and found that we could take a bus for cheap in the morning. But that would require an overnight, so we found a cheap hotel, had a nice dinner, and checked in for the night. The next morning I couldn’t find one of my contact lenses. And of course, I hadn’t bothered to bring a spare set. So now I was effectively blind in one eye, squinting to try to get some semblance of vision as we walked back to the bus station. Cris and I are hyper-punctual, so we were at the station early, and had first dibs on seating. We decided to sit in the very back seat of a Greyhound bus on the right. The bus began to fill up and when every seat was filled, we were excited to get on our way. Cancun! Cervesa! Margaritas! Here we come! But then, more people continued to stream onto the bus. Pretty soon the aisle was filled with people standing. We thought, “Wow, are people going to stand in the aisles for hours?” Yep. Then, two guys climbed up our seats to lay in 69 position in the “free” space behind our heads. We looked at each other with the expression of “Really?” It gets better. Shortly after that some guy gets on the bus with chickens. Yes, chickens. The organic, cage free sort. At that point, the bus departs. And instead of going down the highway, of course, this bus is going to stop at every little town in the Yucatan for people to get off and on the bus. What could have been a 3 hour ride became 8 hours. And since we knew we would end up standing in the aisles with the chickens if we were to get up and do a bio break at one of the many stops, we decided to hold it. For 8 hours. With two guys behind our heads. And chickens near our feet. And I can’t see out of one eye. We finally got to Cancun, and of course, a tropical storm had hit. Although we were able to check into our room, it was stormy and blustery the next day and was projected to be that way for days. We finally decided to abort the whole trip. We were lucky to get to the airport and find there were seats available back to Denver. Thus ends our first Mérida experience. Mérida, Spain was much more fun. We found a nice hotel room, had a great tapas dinner, and the next morning toured all the ruins. 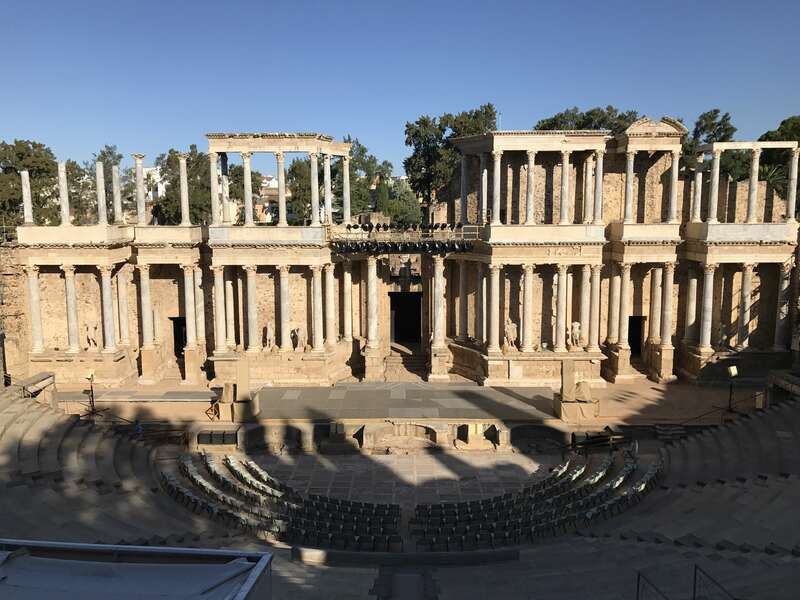 Mérida was founded by the Romans in the 1st century BC, and includes the Teatro Romano which is still used today. Next to the theater is a Circus Maximus. 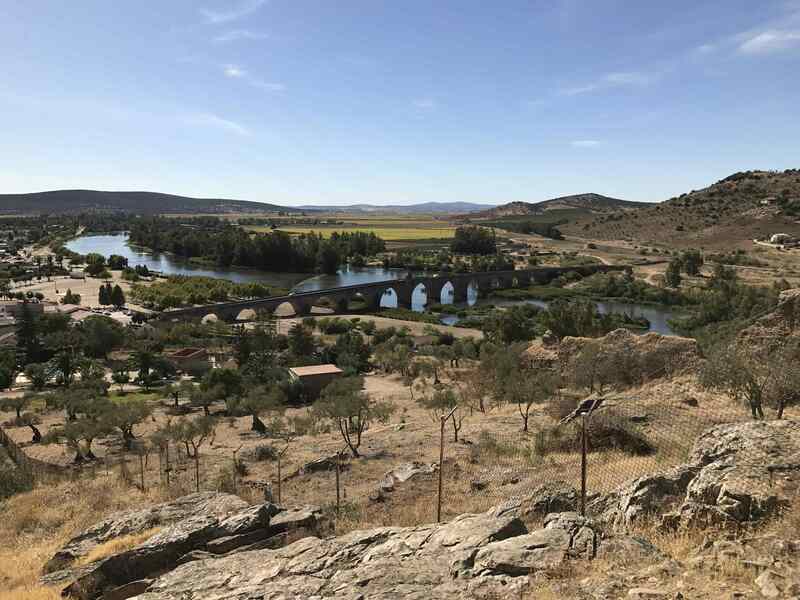 An old Roman bridge, the Puente Romano, over the Guadiana River that is still in use, and is the longest of all existing Roman bridges. 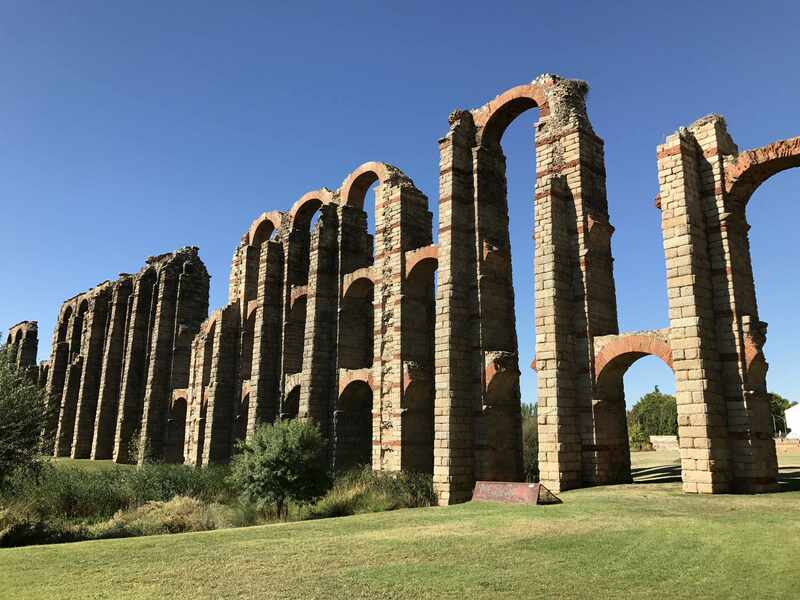 And also an aqueduct, the Acueducto de los Milagros (aqueduct of Miracles). After touring the ruins in the morning, we got back into the car and headed north to Salamanca. 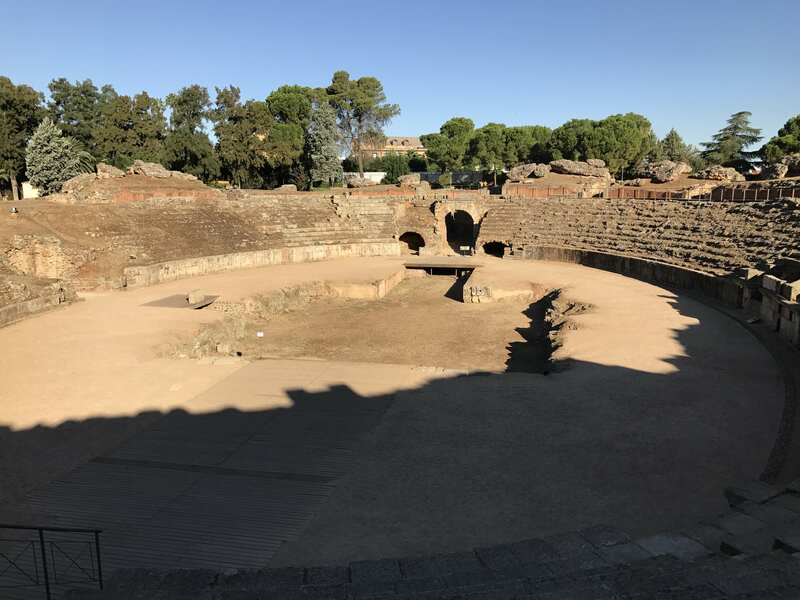 As we headed southwest from Madrid to Mérida, we saw a sign along the highway for a Roman amphitheater, so we pulled over and ended up in Medellín. I’m a Greek and Roman history buff and wanted to see as much “ruinas romanas” as possible. The Romans settled the village in 74 BC. We ended up driving over an old bridge, which was really narrow. At one point another car entered at the opposite side toward us, and I thought for sure we’d need to backtrack, but we passed each other slowly without issue. I was so glad we didn’t get the original vehicle the rental company assumed we Americans wanted – it was monstrous. We downsized to a small Peugeot which made driving and parking in Spain so much easier, and I got to dust off my stick driving skills. After getting over the the bridge and up to the castle on the hill we parked the car and started walking. Absolutely no one was there. We found out the castle was closed for the day, but we were able to walk around and take photos without any issue. Heading southwest out of Madrid down to Merida to the Roman ruins, you’ll see Oropesa, a small town where nobles of Toledo stayed. I, like most Americans, am a sucker for castles. We had one rule on this hastily planned trip. If we see an interesting castle or cathedral off in the distance, pull over and go check it out. We stuck to this rule for the entire trip, and was so worth it. So, we pulled over to get a look. The castle was built around 1400 which you can climb to the top of for great views of the distant mountains. 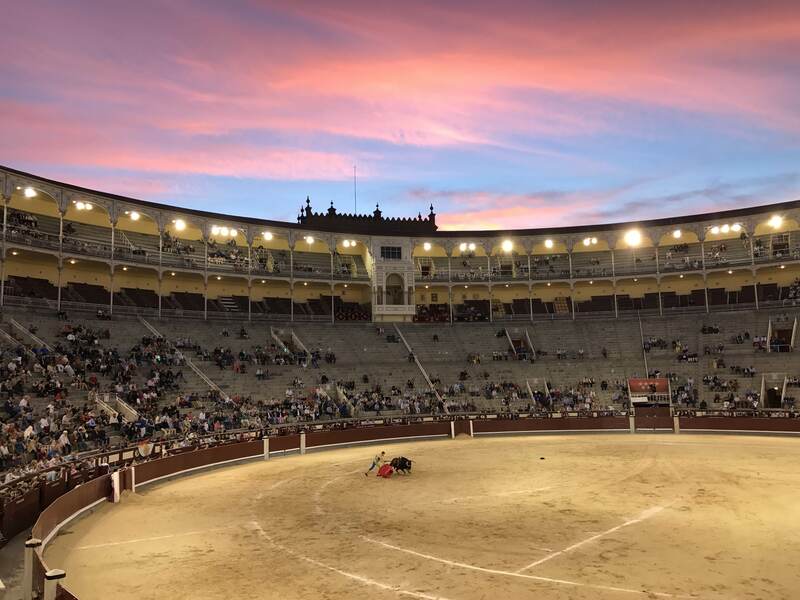 a beautiful night for a bullfight? Ok, so this post isn’t about any ride or hike in the western US, or anywhere in the US for that matter. My wife and I love to travel (she worked for Continental Airlines before they were acquired by United), and I thought I’d share photos from some of the beautiful places we’ve been. We are on a big road trip through Spain and Portugal right now with my father-in-law Felix, who was married to a wonderful Spanish lady from Madrid. Out of the blue during our Labor Day stay in Winter Park he said, “Ed, have you been to a bullfight?” I said no, and he said, “Let’s go see one.” Since Felix is 81, we decided to not wait, and after a few days of planning craziness, the following Friday we were on a plane for Madrid. We arrived Saturday early in the day and were all jet-lagged. But after several coffees and plenty of jamon, we headed down to the venue. To be honest, both my wife and I had concerns about watching a bullfight. I had heard it was brutal, and the young members of our Spanish family contingent refused to go. But it was important to Felix, so we went. I was right – it was bloody and harsh, but I could appreciate the skill of the matador. Additionally the event was on a beautiful warm September night that ended with a stunning sundown. Although I won’t go to another, I’m glad we went – it’s now a week later and Felix is still talking about how much he enjoyed himself. We spent Labor Day weekend with family up at Winter Park. On Saturday Kyle and I spent the day downhilling at the park, and on Sunday most of us headed up to do a long hike up to Stanley Mountain. Winter Park has invested big time in making the resort a year-round destination, and in the summer riding their groomed bike trails in the Trestle Bike Park is a requirement for us. Kyle and I had a blast bombing down Shy Ann, Long Trail, No Quarter, Search and Seizure and the new Wall Street trail. Check out what it’s like to ride some of these crazy trails in these vids. One thing – the GoPro Karma Grip gimbal is sooooo smooth that it makes the trail a lot less scary than it really is. 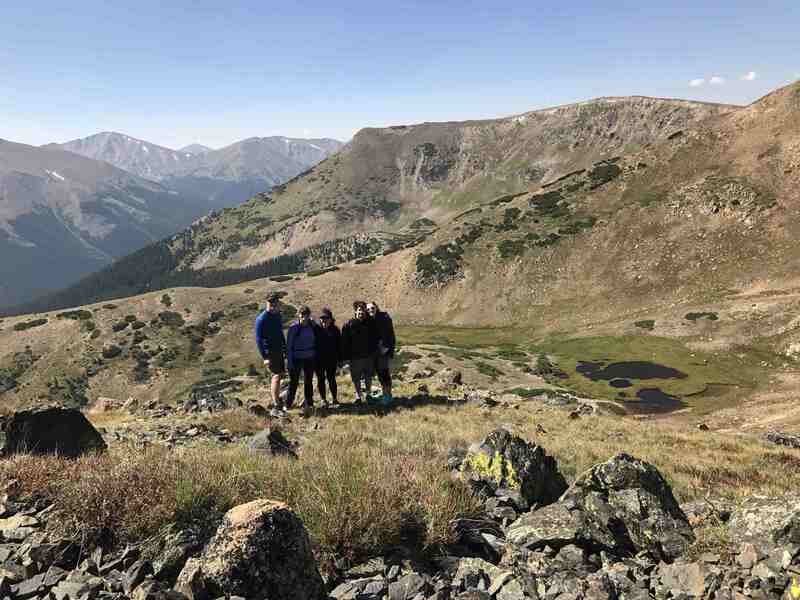 On Sunday, the family drove to the top of Berthoud Pass and headed up to Stanely Mountain on a beautiful late summer day. It’s a pretty easy hike although there is a section of switchbacks up a steep pitch that make the legs burn. We made it most of the way.